by Pough, F. Harvey; Janis, Christine M.; Heiser, John B. 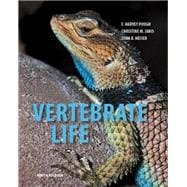 For courses in Vertebrate Zoology, Vertebrate Biology Function, and Paleontology Widely praised for its comprehensive coverage and exceptionally clear writing style, this best-selling text explores how the anatomy, physiology, ecology, and behavior of animals interact to produce organisms that function effectively in their environments and how lineages of organisms change through evolutionary time. The Ninth Editionfeatures dozens of new figures and photos, updated information from molecular data and evolutionary development, and expanded discussions on global climate change, extinction, and conservation. F. Harvey Pough began his biological career at the age of fourteen when he and his sister studied the growth and movements of a population of eastern painted turtles in Rhode Island. His research now focuses on organismal biology, blending physiology, morphology, behavior, and ecology in an evolutionary perspective. Undergraduate students regularly participate in his research, and are coauthors of many of his publications. He especially enjoys teaching undergraduates and has taught courses in vertebrate zoology, functional ecology, herpetology, environmental physiology, and the organismal biology of humans. Currently he is teaching a year-long introductory biology course. He has published more than a hundred papers reporting the results of field and laboratory studies of turtles, snakes, lizards, frogs, and tuatara that have taken him to Australia, New Zealand, Fiji, Mexico, Costa Rica, Panama, and the Caribbean as well as most parts of the United States. He is a Fellow of the American Association for the Advancement of Science and a Past-President of the American Society of Ichthyologists and Herpetologists.